ProComm's Patriot 12 Foot CB Base Antenna is a mast mountable, easily tuneable, 2-section Omni directional 1/2 Wave CB Base Station Fiberglass Antenna. The Patriot is a compact 12 foot base station CB radio antenna that is factory pre-tuned for 27 MHz Citizens band radio frequencies. The Patriot antenna is easily precision field tuned for lowest SWR settings due to its cleverly designed threaded tuning feature. The Patriot base station antenna is user tuneable for use on the popular 10 and 12 meter amateur radio bands, allowing operators to utilize radio frequencies from the 26-30 MHz range. The 2000 Watt P.E.P. rating of the Patriot ensures plenty of headroom for the most popular radios to operate safely, while taking full advantage of available output. The SO239 connector on the Patriot allows for simple integration of RG8X for the all-important antenna to radio connection. ProComm's Patriot base station antenna is for radio enthusiasts that enjoy operating across a wide spectrum of radio bands including: 27 MHz CB radio, SSB, AM, HF, amateur 28 MHz 10 meter band, and the 24 MHz 12 meter band. 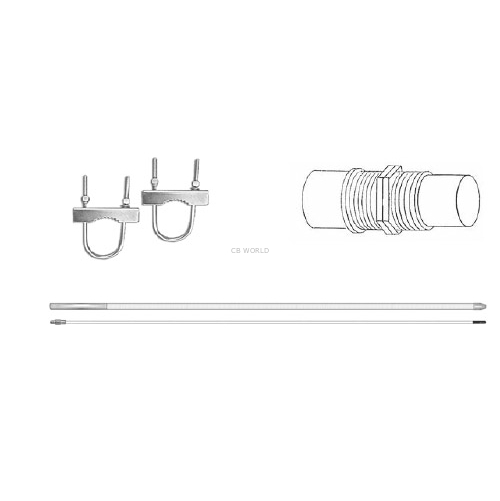 The Patriot is a popular base station CB antenna that can be adjusted for 10 or 12 meter radios. Simple installation and great performance make this antenna a favorite for stationary radio setups. A lighter weight solution than many competitors CB base radio antennas, the Patriot is an excellent addition to any CB or ham shack! A 12 foot fiberglass easy to install and operate CB or Amateur radio antenna. The Patriot is comprise of 2-sections and is an Omni directional ½ Wave CB antenna. If installing somewhere that does not provide a sufficient ground plane, consider getting the PAT12GPK Ground Plane Kit. The use of High quality RG58 or mini-8 CB coax will ensure superior performance with the ProComm Patriot base station antenna. The Patriot comes pre-tuned from the factory for 27 MHz CB radio bands, but field tuning may be required to ensure best performance. 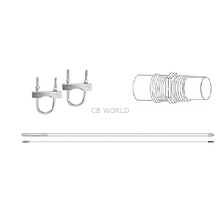 Tuning the Patriot CB antenna is easily accomplished via TWO threaded tuning rings and using the guide to tuning your CB antenna available from CB World's help center.